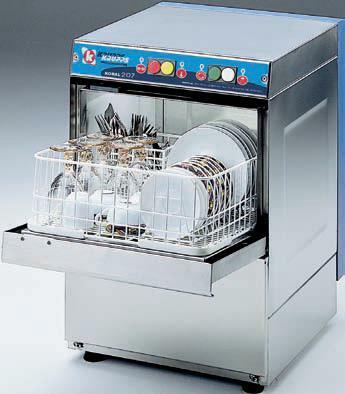 Stainless steel aisi 304 dish washer.
. cap: 240 dishes / hour.
. maximum height of glass or plate: 240 mm.
. basket size: 400 x 400 mm.
. tank capacity: 15 ltr.
. boiler cap: 4.1 ltr.
. power: 220 - 240 v / 50 - 60 hz / 3.8 kw.
. boiler Resistance: 2 kw.
. tank heating element: 2 kw.
. water pressure: 2 ~ 4 bar.
. water consumption: 2 ~ 2.5 ltr / h.
. net weight: 38 kg / gross weight: 36 kg / 0.27 m³.
. packing dim: 530 x 640 x 800 mm.
. dim: 465 x 510 x 640 mm.